Jordan and I decided last week that we wanted to take a trip to Hawaii in March (yay!) and so I decided that to get beach-ready in 10 weeks I needed to lay off the baking…a little =). Mostly, my beach-ready plan includes adding pilates and yoga to my running routine with an overall goal of toning up slightly – nothing drastic. This is actually the only dessert I made all week. I tried to make some healthy dark cherry bread, but it was so “healthy” that it really didn’t taste like dessert haha and the dark cherry puree turned the bread a weird color. Needless to say, you won’t be seeing it on the blog ;). I also had a flop with some coconut muffins and had pretty much deemed this week “Flop Week” until I made this pie. 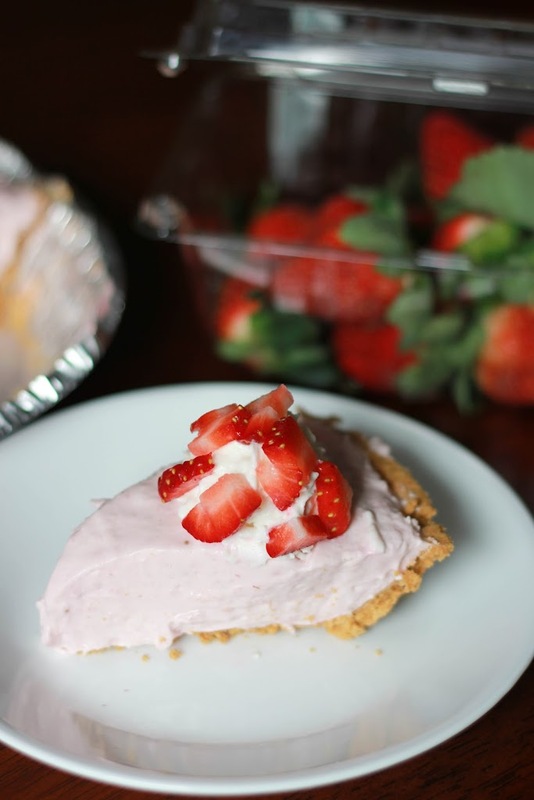 I set out to make a no-bake strawberry cheesecake – somewhat of a spin off my Chocolate Cheesecake Bites. It was 70 degrees here on Saturday and I did not want to heat up my kitchen – because 70 degrees in January is like 90 degrees in June =). Turns out it didn’t taste like cheesecake, but what I ended up with was sooo much better! It tasted exactly like a strawberry milkshake! Sometimes you just get lucky ;). Enjoy! 1. Place cream cheese and sugar in bowl of stand mixer and beat with paddle attachment on medium speed until smooth. 2. Add melted chocolate to cream cheese mixture and beat until combined. 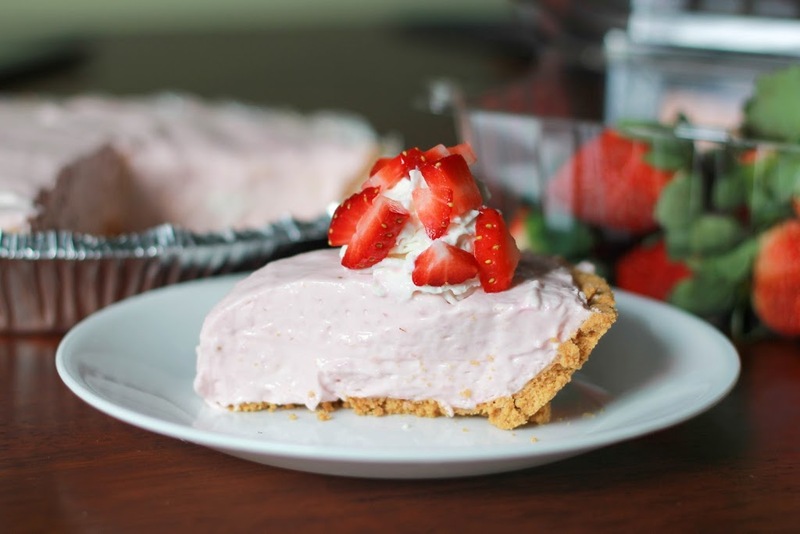 Mix in strawberry puree, vanilla, and strawberry extract. 3. Gently fold in whipped topping and pour into crust. Refrigerate 6 hours or overnight. 1. I’m sure you could substitute real whipped cream for the whipped topping, but I haven’t tried. 2. I used fresh strawberries. Frozen would probably work too but since they are a little juicier you may want to defrost and drain off some the juice before you puree. I&#39;ve made this! It is delicious and really does taste like a strawberry milkshake! And if you are doing Weight Watchers… 8 points for 1/8 of the pie. I have made this twice now, and it has quickly become a seasonal favorite in my house! We ALL love it…me, my hubby, and 3 kids from K to teen! 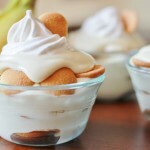 I use fat free cream cheese and fat free Cool Whip, and it&#39;s just fabulous and light, and not overly sweet. LOVE IT! It&#39;s going straight into my permanent recipe box of favorites! 🙂 Thanks for sharing! Your comment makes me smile! I&#39;m glad your family enjoyed this recipe. I&#39;ll have to give your reduced fat version a try :).